Endodontics is a branch of dentistry that deals with diseases of the tooth pulp. Often, the tooth will become damaged or destroyed by chewing on bones or other hard objects. When the pulp becomes exposed from a broken tooth, treatment is required. This is a painful problem for your pet that cannot be ignored. Most pets will not show any signs of pain and will usually continue to eat. Pulp exposure requires endodontic treatment or extraction. Monitoring the tooth for problems and waiting to see if clinical signs develop simply prolongs the pain and suffering for your pet. Endodontic therapy on a fractured tooth is an option that allows the preservation of the affected tooth and is usually less painful than a surgical extraction. What is a "Root Canal"
A root canal or root canal therapy is a procedure that is usually performed on a dead or non-vital tooth. 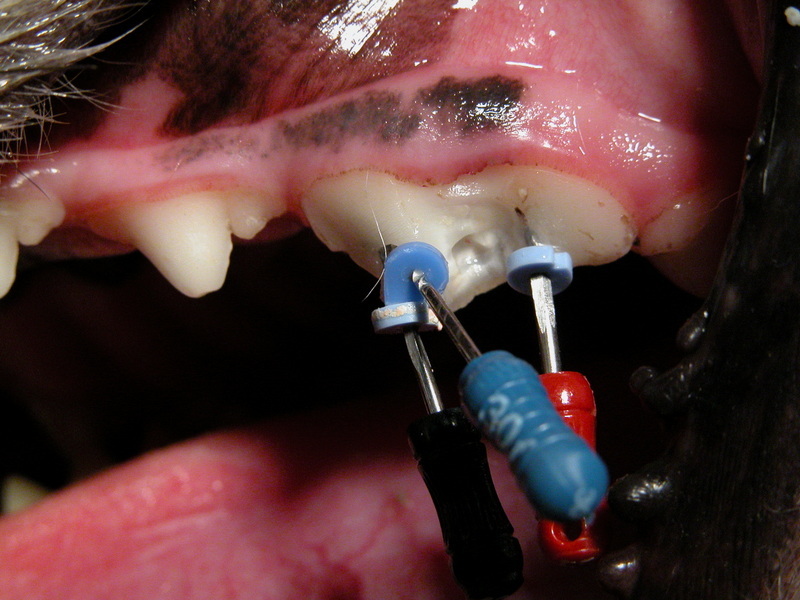 The procedure allows the tooth to remain in the mouth and it preserves the natural chewing ability of your pet. ​An opening is made in the crown of the tooth to access the pulp chamber. Files and irrigation solutions are used to clean and remove the infected tissue and debris from the canal. A permanent material is placed into the canals to seal the pulp chamber and keep it free from infection. A composite filling is placed in the openings that were made in the tooth.